Hi tresha! Good luck with the giveaway . . . but I don't think you'll need as many tissues with my new novel. A man after my own heart. I, too, love the variety of covers for the same book. You mentioned the perception of your male acquaintances towards your writing. What about your children? How do they feel about old Dad being a JAFF author? I imagine that they are excessively proud of you. Congrats on the new release and best wishes for a multitude of sales. See you at the next stop. Some of the colorful science fiction covers have absolutely nothing to do with the story! Marvelous! Both my wife and daughters are interested in my success, but, alas, I appear to be the only Austen aficionado in the family, and they haven't read much in my books. 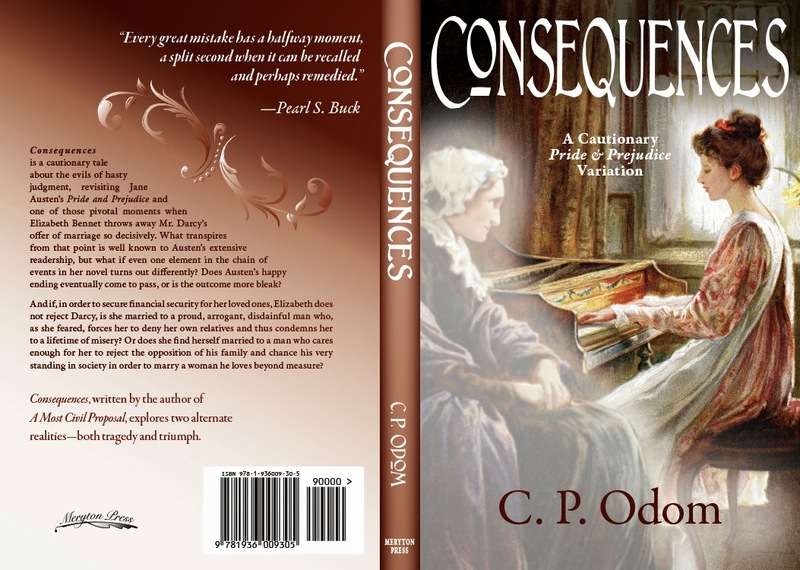 I loved the novel 'Consequences' and I am surprised C P Odom is a male! You go Mr Odom! Would love to win an e-book of "Secrets". Cherri T.
Way back when I thought I might someday write something in the science fiction arena, I decided to use my initials as my author tag, and that's why I asked to be published as C.P. Odom. Actually, I would like to thank you for the implied comment about being surprised. If I'm able to write so that it's not blatantly obvious that I'm a guy, I must be doing something right. But Consequences was a one-off, and it's out of my system. I was in kind of an experimental mood when I wrote it, but I'm a "my glass is half-full" kind of guy, so I don't expect to travel that path again. "Since your blog doesn't want me and it never publishes my comments I will send you mine this way... I love C.P. Odom's stories. I have all the previous ones and I hope I will be able to get this one soon. Please let him know. Thanks in advance!﻿"
Thanks for your comment Teresita, and good luck in the giveaway. And compliments to your persistence, Teresita. I have had a few blogs that didn't want to allow me to post. Being of the left-brained geek persuasion, I eventually figured it out, but it was difficult. I hope you enjoy this book, one way or the other! It sounds wonderful this book, Ceri. I be glad to read it. 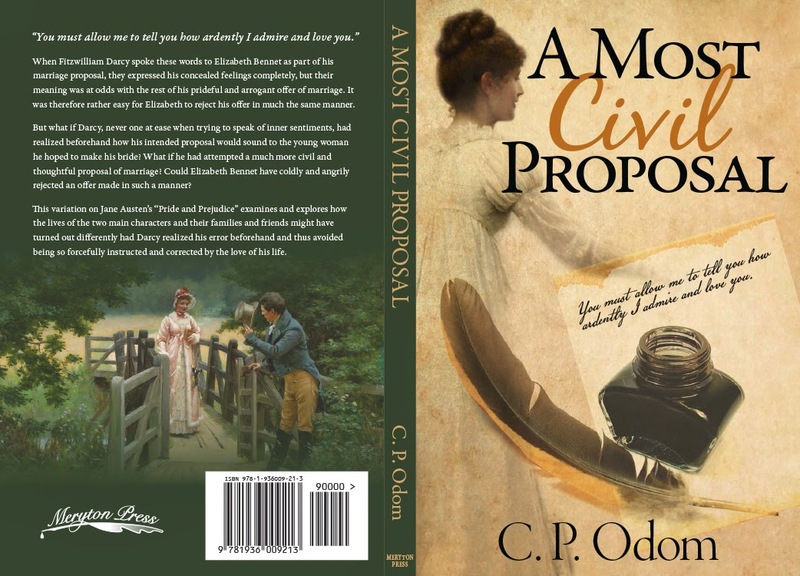 Mr. Odom is a great Author; his work speaks for him. Thank you to Meryton Press for the opportunity the giveaway. Hi Warmisunqu. Good luck with the giveaway, and thanks for the kind words. Thanks Warmisunqu. Good luck in the giveaway! First thing I have to say is this: Colin, you simply MUST write your sci-fi/fantasy P&P story! This particular Jane Austen/sci-fi geek would absolutely love it, I'm pretty sure. I, too, have a collection of sci-fi paperbacks with cover illustrations that have nothing to do with the story. They are colourful, though. One artist was called Chris Foss. Do you have any of his covers? I haven't read AMCP yet, (on my TBR list) but I thought Consequences was a fantastic book. Tough going at times, plenty of tissues needed, but great nonetheless. So I'm looking forward to Secrets very much and wondering how, given the restraints of the times, we get to our HEA. I would like to read a sci-fi/fantasy P&P too Anji! I don't often read sci-fi, but what I have read I've enjoyed as they've been very imaginative. Hi Anji. Actually, I do have some books with Chris Foss art, including one book just of science fiction illustrations. All of the books with his covers are British publications, so I assume Chris hails from there. He seems to be more from the 70s or 80s, and a lot of my paperbacks with the most colorful covers are from the late 50's, 60s, and 70s. Keep your fingers crossed on the Austen/fantasy book -- I've got to find time to write, and, despite being retired, I seem quite busy these days. I found out that the upload just got sent to Amazon and the printer today. The first email from the copy editor at Meryton Press appears to have disappeared somewhere in cyberspace for four or five days. But it'll probably be a couple of weeks before Amazon has any physical copies to sell. Sounds interesting. Hope to win! I love the premise for this book. I hope the Hunsford moment, even though it will be delayed, doesn't put poor Darcy too much through the ringer though. Sometimes I feel a bit sorry for the man! And in this instance he'll be so happy she accepted that the possible rejection later will be all the more painful. Thanks for the giveaway opportunity. It's a great idea isn't it. I don't know how authors manage to come up with fresh ideas for deviations from Austen's plot, it amazes me! Remember the name of the book, Brenda: Pride, Prejudice, and SECRETS. Don't assume there has to be a Hunsford moment--though if there isn't, then that has ramifications that will ripple through the rest of the story. I just love tweaking just one little thing and then keeping the characters true to Austen's characterization and watching how the changes spread out. Which is a partial answer to Ceri, for how this particular author gets his ideas. Austen provided quite a few moments in P&P where one little twitch can have momentous effects. 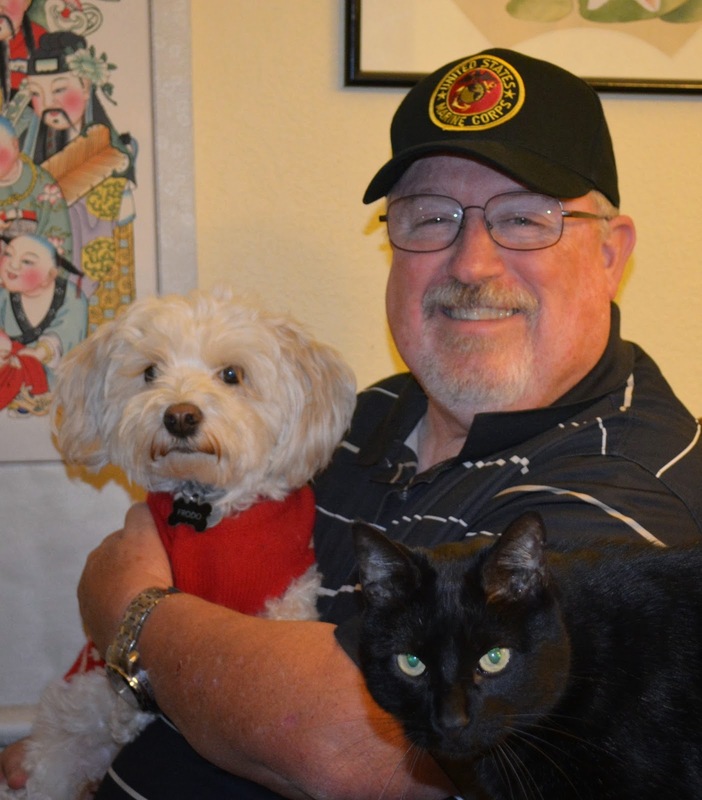 My elder daughter was taking the pic, so I was holding her dog for her. I swear those two seem like Siamese twins at times, as she walks around the house telling Frodo (the dog's name; one of our cats is called Pippen) how wonderful he is. But Shooki, the black cat, was just curious and stuck his head into the photo. We've got two dogs and four cats running amok through the Odom household. Thanks for stopping by Ceri's blog and commenting. Good luck with the giveaway. Yes, I agree, Gabriella, it's a really inventive idea for a variation. I had some fun with not only the main premise but the subplots, so I hope you have fun reading it. Cannot wait for this book. 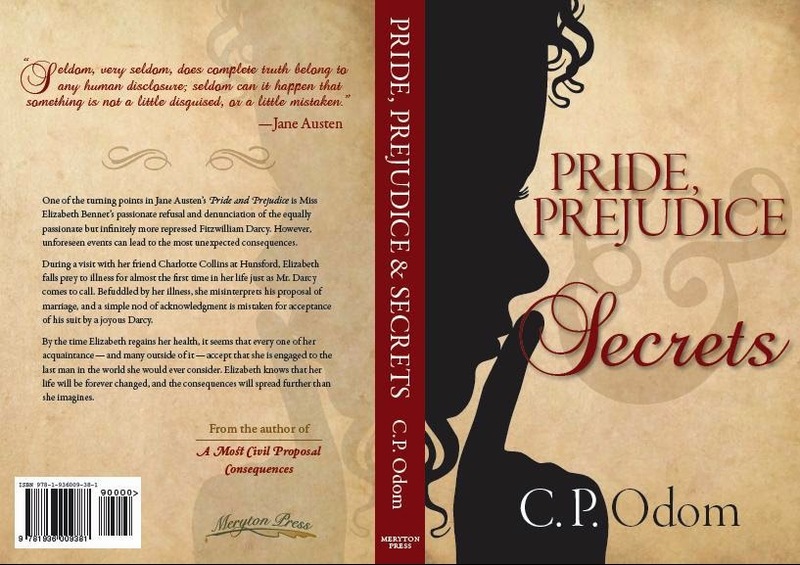 Love your variations of Jane Austen's Pride and Prejudice. One more variation by you, sir, would be a very happy reward. Thank you for your stories. And thank you for your compliments and interest. Happy reading. I know, these poor people! Firstly poor Elizabeth having to deal with an unwanted engagement and then poor Darcy when he realises how she feels/felt about him! Thanks for commenting, Debbie. While I think there are some humorous moments, they are a byproduct and not the main intention. However, since I'm an optimist, the reader may find more humor than I knew I was putting in. Only the reader can decide. I've only read Consequences so far Tina, but I bought A Most Civil Proposal in a post Christmas ebook splurge, so I'm looking forward to reading that soon, glad to hear it's a good read! Only "Consequences," Ceri? I'm glad you had the fortitude to take on another Odom novel. I assure you that "Consequences" was a one-off; I'm definitely more disposed to happily-ever-after than to doom-and-gloom, and "Pride, Prejudice, and Secrets" reflects that. And thanks for reading my other two novels, Tina. I think you'll enjoy this one also. I am very intrigued by this variation. loved your other books so this is definitley on my TBR! Thank you for the giveaway! Thanks, Becky. I hope you enjoy this one as much. This is a great insight of how you come to become an Austenesque writer, Colin. I loved reading and learning something new about authors. Thanks, Luthien. I'll be stopping by your blog next to respond to comments. Thanks for sharing about how you got started in writing P&P variations. It's always so interesting to learn more about an author and their thought process and what inspires them to write. I agree, Dung Vu, I always find it interesting to know what's inspired an author to come up with their plots. Thanks for your comment and good luck in the giveaway. I haven't read Mr. Odom's other books, but I think this might be a good one to start with! Also, I've never read any Austen inspired novels written by a man. Might be an interesting change! Thanks for the giveaway. I have wanted to read Mr. Odom's books for a while now; hopefully this will be my first! I'm looking forward to reading it too Ginna. Thanks for your comment and good luck in the giveaway. Thanks Christina, I added links to the US and UK Amazon sites above.